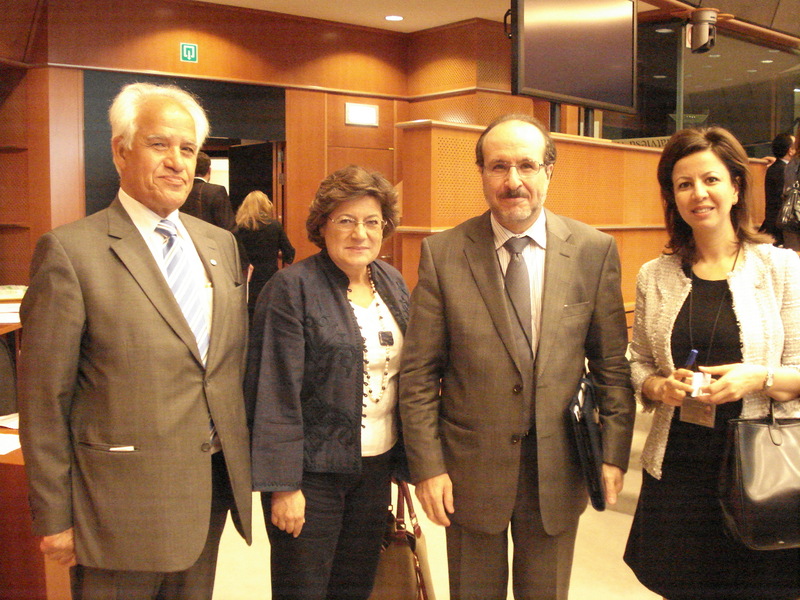 Dr Hassan Aydinli, ITF EU Representative; MEP Ana Gomez; Ambassador Lahebib Adami, Head of the Liaison Office of the League of Arab States in Brussels; Representative of the League of Arab States in Belgium. 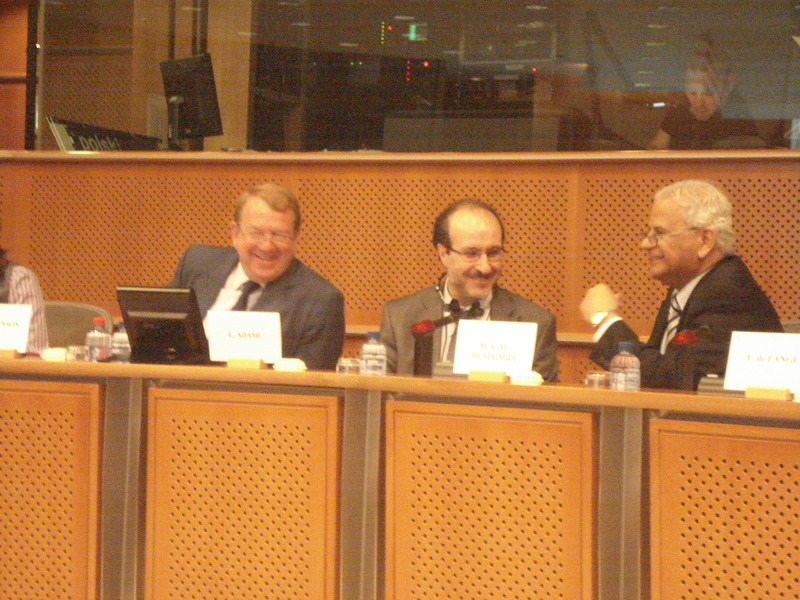 MEP Struan Stevenson, Chair of Delegation for Relations with Iraq; Ambassador Lahebib Adami, Head of the Liaison office of the League of Arab States in Brussels and H.E. Ambassador Mohammed Abdullah Al-Humaimidi, Ambassador of the Republic of Iraq in Belgium. Allow me to start with some words that are not related to today’s ceremony. I would like to condemn in the strongest terms last 25 May bomb blast in Kayseri and deeply regret the loss of life. I would like also to stress once again that the EU stands with Turkey in its resolve to fight against terrorism. Nothing justifies such indiscriminate violence. Coming back to the ceremony, it makes me very proud to be here today at the opening of the “Civil Society Facility – Parliamentary Exchange and Dialogue.” I would like to thank the Grand National Assembly of Turkey, Speaker Çiçek for hosting this event. I would also like to thank the European Commission and Delegation of the European Union to Turkey for their hard work in making it possible. This is an important and exciting opportunity for both the European Union and Turkey. It is an opportunity to dispel some misconceptions on both sides; an opportunity to bring our government officials and members of civil society together to strengthen and affirm our shared values and hopes, and confront common challenges. Many European citizens and their elected representatives have concerns about Turkish accession that could be resolved through exposure to Turkish people and institutions. Knowing that they are working with their Turkish counterparts on a process they too have gone through will build trust and a sense of common endeavour. They may learn that Istanbul is one of the largest and most vibrant cities in Europe and its most popular tourist destination. That the Turkish historical narrative is strikingly similar to their own; one featuring a difficult transition from autocracy to democracy and then having to consolidate that democracy. It is a story familiar to many of us. Having parliamentarians from the European Parliament or from the National Parliaments of the Member States visit Ankara will help those in the Grand National Assembly and Turkish civil society to know that many EU leaders are behind them in this journey towards membership. They can see what being in EU means on a first-hand basis, what implementing the acquis has meant for national legislatures. That joining the EU does not mean losing a sense of self, but rather means allowing Turkey to contribute to the common European narrative. We may look at this Facility within the broader context of the “Positive Agenda” that was launched during Commissioner Füle’s visit on 17 May of this year and fully supported by the Member States. The best way to further develop the common strategic interests of the EU and Turkey is to engage in a wide variety of frank, face-to-face discussions as foreseen in this Exchange and Dialogue. It is my sincere hope that the understanding and close ties brought about by this Facility will help to make progress with those chapters frozen for political reasons and in particular those highlighted by  Stefan Füle during his visit. It is an opportunity to strengthen Turkey’s parliamentary democracy, to make it the driving force in the reform process. It is no secret that the path to EU membership will be long and difficult. Dramatic changes are required of Turkey, changes that can only come after negotiation with all interested parties. Changing the constitution, the fundamental law that governs the working of your nation, is no small matter. It must represent a broad consensus from across society and come from society to be legitimate. This means two things. Point one, the Grand National Assembly must be the centre of gravity for constitutional deliberations. A parliament, as a body elected by the people (the source of all democratic legitimacy) to represent their interests, is the natural forum for discussing changes of this importance. They cannot simply come down as diktats from the government. The Constitutional Conciliation Committee is the right venue for this work and I congratulate Speaker Çiçek as chairperson on the committee’s commitment to consulting extensively with civil society before beginning to draft any proposals. Which leads me to the second point: Constitutional reform must reflect a broad consensus of society and therefore of all its representatives. There must be cooperation between the parties, dialogue must be engaged in, arguments had, compromises made. It will not be easy. Many of you have, perhaps, very different visions of the future of Turkey. That is the nature of politics. Nevertheless, it will be a joint future and it is incumbent on you, as today’s leaders, to leave a constitutional legacy to tomorrow that is seen as legitimate by all citizens of Turkey. It is the intention of this facility to strengthen the role of the Grand National Assembly, and one of the most effective ways to do this is give more voice to civil society. A government that encourages the participation by civil society in decision making, that acknowledges broad rights of free speech, that seeks out and respects the opinions of experts and interested parties is not only more legitimate in the eyes of the people but is all the more effective and efficient for it. And Turkey will not be able to make headway with the accession process without it. The constitutional reform process is an opportunity to incorporate all of Turkish society. By this, I mean bringing into the discussion those historically excluded from the political process. Women, youth, ethnic and religious minorities. Minorities especially should be protected by any constitution purporting to represent all of Turkey. It is not enough to simply recognize their status as a minority. In fact, on its own this can do more harm than good, as we in Europe know only too well. Rather, any new constitution should take care to guarantee minorities all rights and duties of Turkish citizenship. There must be a safe and peaceful political space for them to express their views and legitimate demands as citizens without fear for their livelihoods, liberty, or life. It is a time of great transition and unrest in our neighbourhood and the future of the fledgling democracies is still uncertain. Whether they consolidate their hard-won freedoms and avoid the fate of so many would-be democracies around the world is in large part dependent on us. We must work together closely in all available forums if we hope to face these challenges. Turkish cooperation with the EU’s Common Foreign and Security policy should be reinforced and we invite Turkey to join us as we move to revitalise the Parliamentary Assembly of the Union for the Mediterranean, the presidency of which I recently took over for one year. Turkey is uniquely placed in this regard. Your political and material support, especially in relation to Syria, has been invaluable. So too has the example you have set as a vibrant, secular, Muslim-majority democracy. However, Turkey could be a still better example by continuing with reforms of the judicial system, further strengthening civilian authority over the military, more clearly defining offenses such as ‘terrorism,’ and grant religious and ethnic minorities equal protection and access under the law. Only a few short years after passing the Lisbon Treaty, the European Union is again facing the need to adjust the rules it works by. However, during this necessary period of introspection, we must resist the temptation to ignore the world around us. If anything, we must redouble our efforts to strengthen our ties with our neighbours, especially one as important to us economically and politically as Turkey. It is my sincere hope that this Civil Society Facility will help draw attention within Europe to the opportunities and challenges to be encountered in Turkey’s accession process. Turkish membership in the EU will be a win-win situation for us both; the better this is appreciated by both sides, the better our ability to make progress towards the ultimate goal of accession. Let us move forward, then, with understanding, mutual respect and a spirit undaunted by the challenges ahead. Thank you for your attention and good luck for the facility. The adage that “it is the victors who write history” in matters relating particularly to war and conflict is something of a euphemism when applied to recent military campaigns conducted by America and its NATO allies. For what is disputable – no, let us say repugnant – about the official accounts of these events is not merely a difference in emphasis or nuance on the matter, which the adage may infer. It is rather that the victors’ version of history is a wholesale fabrication, an obscene travesty of actual events. It is not a case of victors writing history, more one of victors “violating history”. Iraq, Afghanistan, Libya, and what is unfolding covertly in Syria and Iran stand out as egregious examples of how the dominant Western powers are not just writing history with a certain self-reflecting vainglorious bias. They are instead concocting events in such a way as to completely distort the facts of history. It is fair to say that in many ways what is taking place is an inversion of realities and language. “Peace-keeping” really means “war-making”; “protecting human rights” really means “bombing civilian centers”; “upholding international law” really means “committing crimes against humanity”. Accusations of “tyrants”, “miscreants”, “rogues” and “renegades” are hurled likes bricks in a glasshouse by perpetrators who arrogate the privilege to call themselves “civilized, democratic, law-abiding governments”. What needs to be contested, therefore, is not some kind of half-baked history, pitted here and there with flaws and hubris, but rather what needs to be challenged is out-and-out willful propaganda purporting as history. In this new Interactive Book No 5, Iraq: A History of War Crimes and Genocide, we show how the policy of successive US governments and their Western allies towards Iraq illustrates this grand criminal deception; we also show how such unaccounted-for gargantuan crimes against humanity have not just decimated the social conditions for millions of Iraqis, but have also poisoned international law and are having far-reaching impacts on the democratic rights of citizens globally. We contend that it is not just imperative to bring Western political and military leaders to account through legal prosecutions for the purpose of restitution for the people of Iraq; it is imperative that we do so for the sake of ending an ongoing global war agenda conducted by these same Western powers, and for the restitution of democratic rights for all citizens in all countries. The devastation of Iraq and the unfettered aggression by Western capitalist powers towards other countries is very much an integral part of the unfolding devastation of social conditions in North America and Europe under the diktat of a class war by a global elite. Understanding what really happened in Iraq, and why, is a vital part of understanding how and why the mass of people need to fight for democracy in the US, Europe and elsewhere. These far-reaching issues including an examination of the evolving Orwellian Police State apparatus in Western countries will be the object of a separate forthcoming I-Book. Take the most basic of words used in common parlance with reference to modern Iraq – the “Iraq War”. The word “war” normally refers to combat between two comparable adversaries contesting over competing claims. But in the case of Iraq that country was invaded without provocation on the basis of knowingly falsified allegations by an overwhelmingly superior military machine – a multiple war crime. The “shock and awe” aerial bombardment that proceeded against a civilian population is another multiple war crime. The US-led NATO military campaign from 2003 until 2012 in which at least 1,000,000 Iraqi civilians, men, women and children, were killed compared with 4,500 US troops cannot be referred to in any meaningful way as a “war”. To do so is to employ an obscene Orwellian euphemism to describe what really happened – that is, genocide. However, search the annals of Western mainstream media and no such simple truths can be found. Reams of newspaper copy and video footage refer endlessly to the Iraq War and they reiterate, with gullible respect, the disingenuous premises pronounced by Western governments and military, thus giving the whole nefarious enterprise a veneer of legitimacy and credibility. At the furthest range of criticism in such media, we might read about how the “Iraq War” was “misplaced”, a “waste” or a “tragedy”. But we will not read that it was genocide perpetrated by war criminals in Washington, London or other Western capitals based on conscious lies and willful fabrications. Truth is censored. In this new Interactive Book we draw on Global Research’s extensive archive to give an accurate account of the origins of the invasion and genocidal occupation. The US-led criminal aggression towards Iraq involves four US presidents: George Herbert Walker Bush Senior, William Jefferson Clinton, George W Bush Junior and Barack Hussein Obama over more than two decades. We examine how a once-staunch Western client state became an object for obliteration. The latter phase of American aggression conducted during more than nine years of US-led NATO occupation involved the most heinous crimes against humanity in a no-holds-barred effort to crush an ancient civilization. This Interactive Book looks at the aftermath of such barbarity and lawlessness, not just for Iraqis and ordinary Americans, but for the Middle East region and beyond. Our bias is to expose official Western claims and accounts of what happened in Iraq, how and why, with uncompromising criticism. Our bias is to record the experiences and suffering of people in the real world, not what governments and military officials purport to have taken place. We are confident that our analysis presents the real story of Iraq, not only what happened and why, but its far-reaching wider significance for international relations. Today’s increasingly militarist foreign policy of the US, its NATO allies and proxy states across the Middle East, Central Asia and Africa can be traced to the awful precedent that is Iraq. Australian author and media commentator John Pilger once noted that journalists could be thought of as being tasked with writing the “first draft of history”. Their reports and analyses of events will one day provide research material for historians. This has rather disturbing implications for future retrospective historical accounts of Iraq. That is because the prominent newspapers of North America and Europe and other mainstream media have, by and large, amply recorded verbatim the official narratives on Iraq that emanate from their governments. In other words, when future historians of modern Iraq draw on the archives in the likes of The New York Times, The Financial Times and Le Monde, they will be drawing on a first draft of history that is falsified, propagandized, and indeed calumnious. Fortunately, the burgeoning of independent media over the past decade has afforded an alternative account of history on Iraq, versions that arguably accord more accurately with actual events. We at Global Research proudly present this volume of wide-ranging articles on Iraq as an antidote of truth to the “victors’ history”. The Iraq War Reader is the fifth in a new series of Interactive Books from Global Research. In Iraq: A History of War Crimes and Genocide, we have selected over 60 articles from hundreds in our 10-year-old archive that cover the background, prosecution and aftermath of the US-led aggression in Iraq. We have also included a review of key intelligence and policy documents, estimates of mortality resulting from the US led occupation (Lancet Report), key videos, photographic evidence and scientific reports pertaining to war crimes. The book is structured in Ten Parts, these together with highlighted chapters include an analysis of the historical background of the 1991 Gulf War, the atrocities committed during the “sanctions regime” (1991-2003), the extensive crimes committed against the Iraqi people during nine years of military occupation. The latter include the carpet bombing of urban areas, the planned devastation of the Iraqi economy including the confiscation of the country’s extensive oil reserves, the programmed demise of State institutions including public health and education, the targeted and systematic assassination of the country’s scientists, engineers and intellectuals, the ruin of Iraq’s research and academic institutions, the pillage and theft of Iraq’s archeological heritage. The unspoken agenda was to destroy Iraq as a Nation State, establish a US proxy regime and, quite deliberately, impoverish the people of Iraq under the banner of “democratization” and “post-war reconstruction”. The book also addresses the Pentagon’s propaganda campaign, its various PR Psy Ops, which portray Iraq, in the eyes of Western public opinion, as an outright evil “rogue state” supportive of Osama bin Laden, the bogeyman and alleged mastermind behind the 9/11 attacks. Fiction become Truth. “Evil folks are lurking”. Al Qaeda’s leader Osama bin Laden is supported by Iraq’s President Saddam Hussein. Iraq is portrayed as a “State sponsor of terrorism”. WMD and Al Qaeda related concepts and images are routinely funnelled into the Western news chain and on network TV, with a view to affecting the human mindset of millions of people. War becomes peace. the threat of WMD by the avowed enemies of the Western World, repeated ad nauseam, is intended to create confusion, namely to prevent people from comprehending the “real outside World” of war, politics and the economic crisis. This Iraq War Reader also reveals the sinister machinations of British Prime Minister Tony Blair’s inner political circle to churn out fake yet “reliable” intelligence documents on Iraq’s WMD program. These fake intelligence dossiers are then candidly presented by US Secretary of State Colin Powell to the UN Security Council (February 2003) as a means to acquiring the UN “green light” for an invasion of Iraq. Part I is entitled Historical Background: Regional Hegemony and The Battle for Oil. As brought out in Felicity Arbuthnot’s essay, the systematic campaign of US-NATO aggression towards Iraq involved the participation of no less than four White House oresidents and five British prime ministers over a 21-year span. In a wide-ranging historical essay, Mahdi Darius Nazemroaya shows how the conquest of Iraq was a key part of a long-term roadmap for Washington’s hegemony in the oil-rich Middle East region. Part III on The Pretext to Wage War brings forth the issue of the fake intelligence documents used to justify the invasion, with contributions by professors Michel Chossudovsky and Glen Rangwala. Part IV From “Shock and Awe” to Occupation and Resistance focusses on the contours of what author Chris Floyd calls The Anglo-American Dirty War. Part V on the Role of the United Nations includes the contribution of former Assistant Secretary General Denis Halliday, focussing on how the United Nations, in the wake of the invasion, paid lip service to the illegal occupation of Iraq in blatant violation of the United Nations Charter. Part VI, with contributions by Michel Chossudovsky, Max Fuller and Ghali Hassan, focusses on the heinous legacy of the clandestine unleashing of sectarian death squads by America and Britain on the populace, which served to divide and rule and also to justify the illegal occupation of a sovereign country. Modelled on US covert ops in Central America, the Pentagon’s “Salvador Option for Iraq” was carried out under the helm of the US Ambassador to Iraq John Negroponte (2004-2005), who had served as US ambassador to Honduras in the early 1980s. This “terrorist model” of mass killings by US sponsored death squads had been applied in El Salvador, in the heyday of resistance against the military dictatorship, resulting in an estimated 75,000 deaths. The “Salvador Option in Iraq” consisted in the use of death squads “to fight against the rebels”, namely the Iraqi resistance. In 2011, “The Salvador Option: was applied in Syria. The US Ambassador to Syria (appointed in January 2011), Robert Stephen Ford was part of Negroponte’s team at the US Embassy in Baghdad (2004-2005). Civilian casualties in Iraq were triggered by daily terrorist attacks and suicide bombings of a sectarian nature. The media in chorus presented “Al Qaeda in Iraq” headed by (the late) Abu Musab Al Zarqawi as responsible for the suicide bombings, without acknowledging that Al Qaeda was a creation of the US intelligence apparatus. In Iraq, Al Zarqawi was described as the bogeyman, intent upon “igniting a civil war between Sunnis and Shiites”. But is that not precisely what US intelligence was aiming at ( “divide and rule”) as confirmed by several analysts of the US led war? Pitting one group against the other with a view to weakening and destroying the resistance movement. Part VII of the Iraq War Reader exposes the complicity of the Western mainstream media in covering up the appalling onslaught of violence against the Iraqi people, from the initial carpet bombing of the country through the following nine years of murderous occupation. Part VIII entitled War Crimes: The Evidence provides an detailed dossier of evidence and analysis of crimes against humanity including the testimonies of key witnesses and victims of US sponsored war crimes. This body of evidence and opinion, as outlined by Professor Francis Boyle, Prosecutor in The Kuala War Crimes Tribunal, makes the case that past and present American and British political leaders are liable to stand trial for war crimes in Iraq. From the outset to its ongoing repercussions, this was a war of aggression comparable to Nuremburg standards. And political and military chiefs should be held accountable as a matter of legal and moral principle. The detailed research of Dirk Adriaensens and Bie Kentane of the BRussells Tribunal, Dahr Jamail, Abdu Rahman, Professor Alfred McCoy, Tom Burghardt, the sworn testimony of Professor Ali Shalal, “The Man Behind the Hood” tortured at Abu Ghraib prison, provide ample evidence of the extensive war crimes committed in the name of the “international Community” by president George W. Bush and his indefectible British cohort, Prime Minister Anthony Blair. Finian Cunningham recalls one of many war crimes, the Haditha massacre in 2005 in which 24 civilians, including women and children, were slaughtered in cold blood by US troops. Not one of the soldiers or their commanders involved in this barbaric crime was convicted, as with countless other such crimes in Iraq and elsewhere. Yet in the same week that the Haditha massacre trial in the US closed without a single conviction, Commander-in-Chief Barack Obama had only glowing praise for the heroism of American troops in Iraq in his 2012 State of the Union address. The extensive dossier on war crimes in Part VIII also includes the results of the Lancet Study on post-invasion mortality, the essay by Professor Souad N. Al-Azzawi on depleted uranium contamination. Several important videos in Global Research’s archives can also be consulted including the controversial Cockpit Video on the Strafing of Civilians in Fallujah. Part IX entitled The Criminalization of War. Prosecuting the War Criminals includes essays by Richard Falk, Francis Boyle and Finian Cunningham as well as video interviews with Dr. Mahathir Mohamad, Gurdial Ninjar Singh, Denis Halliday and Michel Chossudovsky. In Part X entitled The Aftermath: The Destruction of Iraqi Society, Felicity Arbuthnot, Hugh Gusterson, Jack A. Smith and former UN Assistant Secretary General Hans von Sponeck provide the reader a harrowing glimpse of the scale of destruction in Iraq by the US, Britain and other NATO powers. An ancient civilization with its proud traditions in education and culture has been bombed and brutalized with irreparable losses. What we need to understand urgently is that the barbarism inflicted on Iraq continues to be unleashed by the US-led powers in their ongoing campaign of permanent war for global dominance. As Mahdi Darius Nazemroaya points out in cogent analyses: the US has rewritten the constitution of vanquished nations including Iraq and Afghanistan as part of Washington’s empire-building project. Crucial to understanding the full impact of the US-led war of aggression on Iraq is the concomitant erosion of civil liberties in America and Europe. The crimes committed in Iraq have ironically served to amplify the spurious “war on terror”. This has in turn rebounded in multiple insidious ways to increase state security powers against citizens and to justify the creation of virtual police states that can spy, detain and assassinate citizens on the basis of secret executive orders. The war on Iraq and Afghanistan have led to the massive expansion in state powers for surveillance against citizens and anti-war protesters in particular, with far-reaching implications for democracy. Incipient fascism has now become the de facto form of government in supposed Western democracies. The criminalization of resistance in Iraq to illegal occupation goes hand-in-glove with the criminalization of resistance in the US and Europe to war-making. Obama asserted: “The Iraq War is over… We have a clear path to fulfill our mission in Afghanistan”. In this way, the US Commander-in-Chief was stealthily taking credit for ending “a decade of war” as if he had fulfilled in good order his 2008 presidential campaign promises to end America’s foreign wars. He went on to mendaciously conflate these military campaigns as parts of a noble agenda of “War on Terror”. Nothing could be further from the truth. For a start, the presumptive “peace president” had cynically reneged on pledges to the war-sickened American electorate to promptly withdraw troops upon his election. Obama has in office overseen a dramatic escalation in the American ruling class’s militarism at home and abroad, as well as arrogating executive powers to spy, detain and assassinate citizens and non-citizens alike solely on his command and secret information. The long-delayed dates marking official troop withdrawal from Iraq and Afghanistan belie the fact that both countries will continue to host thousands of American military, Special Forces, secret service agents and private mercenaries for many years to come. Merely declaring a “war over” does not mean that it is over. Iraq is all too painfully a case in point. The bulk of the US military forces may have departed from Iraq in December 2011, but in terms of daily violence, deprivation, suffering and trauma, the people of Iraq are still very much wracked by foreign aggression. After nine years of occupation, Iraq is not “sovereign, stable and self-reliant” – as Obama claimed on the eve of troop withdrawal. Daily bombings and shootings claiming hundreds of lives every month mark a country that is riven with bitter sectarian conflicts – conflicts that were cynically inflamed by the NATO occupying forces as a means of subduing the resistance to an illegal occupation. Simmering hostilities between Shia, Sunni and Kurdish provinces threaten to explode into all-out civil war and fragmentation of Iraq. Infrastructure and basic utilities have been destroyed by years of NATO aerial bombardment and previous years of crippling economic sanctions. Millions of families remain homeless and displaced. One in three Iraqi children have been made orphans. Unemployment, poverty and malnutrition are rampant. The same prognosis of violence and misery can be made for Libya and Afghanistan when US-led NATO forces are due to withdraw from the latter country in 2014 – bequeathing again a shadow army of militias, military trainers, contractors and Special Forces amid a country reduced to rumble. What we are witnessing is not presumed episodic war, with a discrete beginning and end, for some noble purpose, as claimed. But rather, we are witnessing the violent conquest of sovereign countries by Washington and its Western allies, the installation of pliable corrupt regimes that serve Western interests, and the ongoing low-level military occupation of these countries to ensure subjugated status. Iraq is a harbinger of the new militarism – wars of aggression without end in which devastation in targeted countries becomes the status quo. The same nefarious process can be seen for Afghanistan, Libya and any other country – currently Syria and Iran – that befalls the imperialist attentions of the US-led Western powers. This is a thoroughly criminal process involving international aggression, crimes against humanity, and plunder and theft of sovereign resources. Iraq’s estimated hydrocarbon reserves of 112-115 billion barrels of oil – the earth’s second-largest known reserves after Saudi Arabia’s – were the main prize, incredibly downplayed or overlooked by the Western mainstream media. Having previously enjoyed a high standard of living, the majority of Iraq’s people are now struggling in poverty with power and fuel shortages, while Western oil giants Exxon, Chevron, British Petroleum and Total are tapping the country’s vast natural wealth, paying off local elites for the privilege. 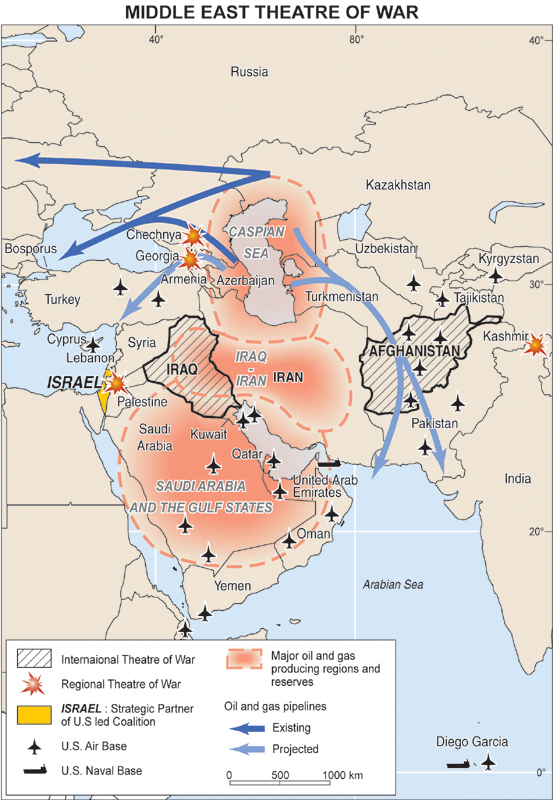 The same agenda of hegemony over energy resources applies to Afghanistan, Libya and Iran. Syria is not a leading oil producer, but it is a crucial staging post towards Western regime change in oil-abundant Iran. This dynamic for rolling conquest will not stop with these countries. Recall that former US General Wesley Clark disclosed a Pentagon war plan from 2001 that included the above and additional countries for conquest – Lebanon, Sudan and Somalia. In effect, this is a global war agenda that the US-led capitalist powers are inextricably pursuing in line with their deteriorating economic status. The desperate drive for control by the US and other Western powers over the oil and gas lifeblood of the waning capitalist world economy will inevitably bring these powers into confrontation with other countries, Russia and China in particular. The seeming insanity of this seemingly wanton global militarism is dictated by the cold logic of capitalism. Understanding this underlying driving force is key to understanding, and ultimately challenging, American-led global militarism. Such naked imperialism cannot be conducted openly in the eyes of the world; it has to be covered up with a wall of lies, the particular lie or pretext to be emphasised at any given time depending on the target country in question. Iraq possessed “weapons of mass destruction that could be launched within 45 seconds” we were told by American and British leaders George W Bush and Anthony Blair, who based their claims on concocted fantasy. Iraq was also linked to Al Qaeda, the murky global terror network created by the CIA and MI6 that allegedly carried out the 9/11 attacks on New York and Washington. When that lie wore thin, we were then told that Iraqis needed to be liberated from a Hitler-like dictator Saddam Hussein, who notwithstanding was formerly a favoured Western client until he blundered over the boundaries of Western oil geopolitics. Latterly, after these pretexts could no longer be sustained, Bush’s successor Barack Obama would assure the public that the American-led occupying forces were “consolidating democracy and sovereignty” – albeit in a country that was torn apart by US-induced sectarian fratricide and subordinated to foreign oil companies. All these baseless claims, pretexts and allegations have been faithfully parroted by the mainstream media. And so the Western war and lie machine trundles on, conjuring new pretexts for smashing its way into the next countries to commit yet more atrocities and crimes against humanity in its conquest of natural resources. The significance of Iraq is the heinous precedent that it set. Here, Washington and its Western allies transgressed international law in the most blatant, criminal manner to commit genocide. Yet not only Western mainstream journalism, but also academia, the legal profession and other sectors of civic society gave cover to such crime, or at best failed to hold the perpetrators to account. And, as criminologists will testify, when a criminal gets away with crime, then there is nothing to hold him from committing further crime. The ongoing criminal US-led occupation of Iraq and Afghanistan, the murderous mass bombing of Libya by NATO, the clandestine Western-backed terrorism against Syria, America’s drone assassinations in Pakistan, Yemen, Somalia and elsewhere in Africa, and Washington’s swivel-eyed threats towards China and Russia are all proof that America’s global war of aggression has become the perverse new normal. Western mainstream media has indeed much to answer for in its complicity in global militarism and concomitant crimes. The reality check of how criminally deranged the US-led Western powers have become is their ongoing aggression towards Iran. Less than a decade after launching genocide on Iraq based on an outrageous fabrication of weapons of mass destruction, the same criminal powers are repeating the same calumnies against Iran with “no options off the table” threats that allude to pre-emptive nuclear attack. And the Western mainstream media that aided and abetted the genocide in Iraq are once again giving credence to the calumny over Iran. This is the descent into barbarism that happens when victors violate history and are not held to account. We are then condemned to repeat history, no matter how barbaric and crass that repetition is. This Interactive Book from Global Research is an attempt to set the historical record straight with a truthful perspective. By arming people with the truth, we may then stop the criminal repetition of history because, armed with the truth, we hope that Western publics in particular will begin to hold their war-mongering governments to account in the most rigorous way. Michel Chossudovsky is an award-winning author, Professor of Economics (Emeritus) at the University of Ottawa. He is the Founder and Director of the Centre for Research on Globalization (CRG), Montreal and Editor of the globalresearch.ca website. He is the author of The Globalization of Poverty and The New World Order (2003) and America’s “War on Terrorism”(2005). His most recent book is entitled Towards a World War III Scenario: The Dangers of Nuclear War (2011). He has taught as Visiting Professor at universities in Western Europe, South East Asia, Latin America and the Pacific. He has acted as an adviser to governments of developing countries and has worked as a consultant for the several international organizations. Prof. Chossudovsky is a signatory of the Kuala Lumpur declaration to criminalize war and a member of the Kuala Lumpur War Crimes Commission (KLWCC). 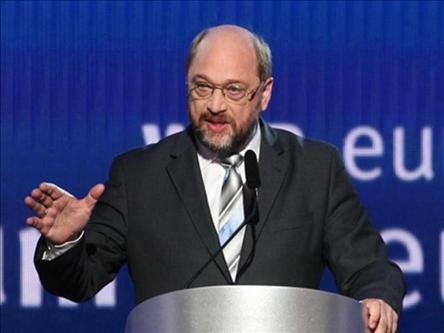 He is also recipient of the Human Rights Prize of the Society for the Protection of Civil Rights and Human Dignity (GBM), Berlin, Germany. He is also a contributor to the Encyclopaedia Britannica. His writings have been published in more than twenty languages. Finian Cunningham is currently Global Research’s Middle East and East Africa Correspondent. He has written extensively on international affairs. Previously, he was based in Bahrain and witnessed the upheavals in the Persian Gulf kingdom during 2011 as well as the subsequent Saudi-led brutal crackdown against pro-democracy protests. He is now based in East Africa. Finian Cunningham’s forthcoming book is: Bahrain and the “Arab Spring”. Due to formatting issues pertaining to diverse archives extending over ten years, a number of unresolved glitches have emerged in font size and style which have affected titles and authors’ names. Excerpt from The Control of Oil. What is ultimately at stake in Iraq is the intention on the part of the U.S. and its indefectible British ally to establish control over one of the world’s largest, cheapest and most easily accessible oil reserves. The blatant distortion of the truth and the systematic manipulation of all sources of information is an integral part of war planning. In the wake of 9/11, Secretary of Defense Donald Rumsfeld created to the Office of Strategic Influence (OSI), or “Office of Disinformation” as it was labeled by its critics. the “Terrorist Network” in Northern Iraq, Baghdad or Washington? The same British forces used to create divisions amongst Irish Catholics and Protestants in Northern Ireland have been working in Iraq to create divisions. VIDEO: The United Nations’ Role in Peace and War. Whereas the invasion was in breech of international law, although eased by the acquiescence of the UN, and was globally condemned, the occupation was on the other hand more readily accepted as a new, if unlawful, reality. Bush appoints a Terrorist as US Ambassador to Iraq, Who is John Negroponte? FLASH MOVIE: Who is behind the Death Squads in Iraq? The Occupation-orchestrated violence between Iraqis was meant to provide a pretext for the long-term occupation of Iraq, and direct Iraqis anger away from the brutality of the Occupation. The US intelligence apparatus has created it own terrorist organizations. And at the same time, it creates its own terrorist warnings concerning the terrorist organizations which it has itself created. The media in chorus presents “Al Qaeda in Iraq” headed by Al Zarqawi as responsible for the recent suicide bombings, without ever mentioning that Al Qaeda is a creation of the US intelligence apparatus. Western journalists and pundits are the main agents of this distorted propaganda. The aims are to portray the Iraqi Resistance as violent “religious fanatics” isolated from the rest of the population. The Saddam trial is a theatre. It is a Hollywood show to divert attention from the destruction of Iraq and the massive war crimes committed against the Iraqi people. Enforced Disappearance: The Missing Persons of Iraq. Always Someone’s Mother or Father, Always Someone’s Child. The number of Iraqis detained by occupation forces is now well over 60,000 -far in excess of the commonly quoted official figure of 17,000. News and Comment by The Kurdistan Tribune: 25.5.2012 – Dana Ahmed Majid’s conduct as the governor of Sulaymani (from 2005 to 2009) was twice censured by the audit office: For using public money for his office and close aides and for mismanaging money allocated to tackle the drought that hit the Sulaymani region’s countryside. These reports were issued by Jalal Sam Agha, the Sulaymani audit office director, at the end of 2010. Recently corruption charges were brought against Sulaymani mayor Zana Hama Salih, who was arrested and last month died mysteriously in a security cell. Some observers speculated at the time that Dana Ahmed Majid – who publicly switched his allegiance from the PUK to Gorran in 2010 – might also face legal proceedings. However, this has not happened so far and our sources inform us that Majid moved to London last December and hasn’t been home since. The Head of the Turkmen Movement in Syria Abdülkerim Ağa visited the Iraqi Turkmen Front Turkey Representation. Abdülkerim Ağa who was received by the Turkey Representative and MKYK member Dr. Hicran Kazancı talked about the developments in Syria as well as the status of the Turkmen. Hicran Kazancı said that in order to be included in the process after the regime, it was vital that the Turkmen are included in the national council to be formed including the opposition. The actual problems will start after the fall of the regime rather than now. Maybe the actual ethnic conflict originated from sects and other reasons will start then. The country may be thrown into chaos. As you know, the wolf prefers tempestuous weather and likewise all extremist groups who hunt will endeavor to be more efficient during such times. As such, the Turkmen regardless of their outlooks, must forget the past and unite to further the Turkmen cause after the regime. This is essential because the Turkmen are the key for ensuring stability in the region. At the end of the meeting Abdülkerim Ağa expressed his appreciation for the Iraqi Turkmen Front. Words that Tony Blair spoke over the phone to George Bush on the eve of the Iraq war are to be made public, a tribunal ordered today. The Foreign Office has been ordered to release parts of the note detailing the conversation on 12 March 2003, a week before the invasion of Iraq began. The two leaders are believed to have discussed whether they should go to the United Nations for a resolution specifically authorising them to go to war. British and US diplomats had worked frantically to try to win over a majority of members of the Security Council. Then on 10 March, France’s President Jacques Chirac told French TV that even if there was a majority, France would vote ‘no’, thus vetoing the resolution. It was likely that Russia would also wield a veto. It was after hearing President Chirac’s remarks that Tony Blair finally gave up the quest for a second UN resolution, a decision he is assumed to have conveyed to President Bush in that 12 March phone call. Documents released by the inquiry into the war show that the French repeatedly protested at the interpretation which Britain put on Chirac’s words, but their objections were ignored. Sir John Holmes, who was Britain’s Ambassador to France at the time, told the inquiry that “there was ambiguity” in the President’s remarks. The tribunal ordered that an edited version of the note should be released within 30 days. The following is a presentation given by Bie Kentane – BRussells Tribunal – in the Dialogue sessions of the Kuala Lumpur War Crimes Tribunal, 07 May 2012.